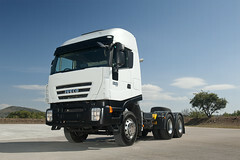 The Trakker can be fitted with any type of tipper body for the transport of quarry or mine aggregates. o lower radiator protection against accidental impacts. with Cursor 13 engine (up to 440 HP) for heavy-duty applications (available with partial or all-wheel drive).